IV. Why Didn’t They Register? 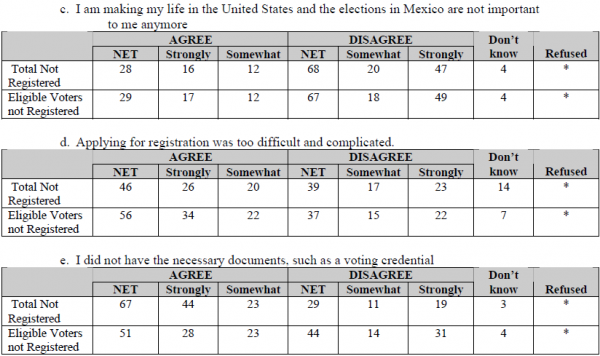 Mexicans living in the United States offered a variety of reasons for why expatriates did not register for the absentee ballot. The survey shows that the requirements for registering, along with a lack of information on the process, were significant obstacles. Many people also found the process too difficult. Mexico remains of primary interest to many and many view the upcoming elections as important to them. But the survey also found that a lack of knowledge about the politics of their home country also discouraged many from registering. The survey posed five different reasons why people might not have registered, and respondents were asked to say whether they agreed or disagreed with each. Almost seven out of ten, the highest response, agreed that not having the necessary documents was a reason for not registering. Not having enough information on how to go about registering was also high on the list, cited by 55 percent. And 46 percent cited the difficulty in applying for registration as a reason. The responses to two other possible reasons for why people did not register offer a window into how expatriates might have brought their personal experiences to play. About six out of 10 said that not being sufficiently informed about Mexican politics was a reason why people did not register. Next to the lack of documents, this possible reason received the second highest response (61 percent). The one reason that was rejected, by a significant majority, was the possibility that people did not register because the focus of expatriates is on life in the United States and not back home Mexico. The strongest reaction was to this possible reason. Almost seven out of 10 disagreed, and of those who disagreed, 47 percent said they disagreed strongly. The law adopted by the Mexican congress in June 2005, authorizing expatriate voting, established procedures for seeking an absentee ballot that some leaders of Mexican organizations in the U.S. considered burdensome. These complaints included: Applicants were required to submit a photocopy of a lease or a utility bill in their own name as proof of their home address in the U.S. although many recent immigrants share housing and do not have such documentation. Mailing the application required going to a U.S. post office and paying $8 for the registered mail, in addition to postage. Doing so, and filling out a form that required a name and home address, might be especially troublesome for the many Mexicans who are living in the United States illegally.